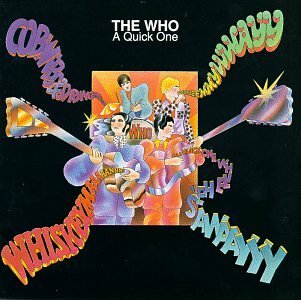 Reissue Review: The Who, "A Quick One"
Started in September of 1966, the second album by The Who was to be a very different affair from their debut, My Generation, for several reasons: gone was producer Shel Talmy, who had signed the band, oversaw their recordings and got them signed to Decca Records in the U.S. and U.K. By breaking ties with Talmy, the band also went to court to get away from Decca in England, which they did (they remained on the label for the U.S. market). In place as producers were Townshend and co-manager Kit Lambert. Agent Robert Stigwood stepped in to help by setting up a label, Reaction Records (through Polydor), and get the band back in the studio – the first labors of this new union bore the fruit of 3 bona-fide major hit singles: “Substitute”, “I’m A Boy” (which became their first British number one) and “Happy Jack”. The period with Reaction only lasted those three singles, an E.P., “Ready Steady Who” and the second album, initially proposed to be called Jigsaw Puzzle. While the only “mistake” – and I’m using the term loosely, as it’s not awful, just unnecessary – is the cover of Martha and The Vandellas “Heat Wave”. With all the members of the band contributing original material for this record, it didn’t need to make the final running order – they could have easily used one of the B-sides of the recent singles (version 2 of “Circles”, “In The City” or “I’ve Been Away” or “Disguises” from the E.P.). Having said this, it’s a masterpiece of an album – showing The Who at their creative best during the height of their transition from Mod to Pop Art. 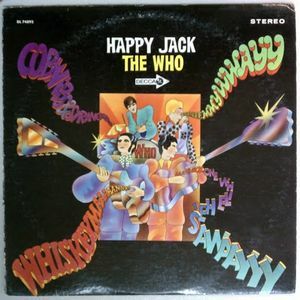 And when it was unveiled in December, 1966, the now-christened A Quick One was just right (especially in the U.S., where “Heat Wave” was dropped in favor of the recent hit single “Happy Jack”, which became the title of the album as well). This newly-released vinyl pressing is, again, the British edition and it’s presented in mono (as is My Generation) and although I am no audiophile, the mono pressing simply explodes out of the speakers at you. Opening with one of the most power-charged numbers in their canon, “Run Run Run” is one motoring starter track. Heavy on the riffs, loud and roaring, then building up with a key change toward the end and as always, those stellar harmonies on the chorus, it’s the perfect entry to this LP. Entwistle’s classic, “Boris The Spider” follows and thus the black-humor legend of The Ox is sealed. Keith Moon’s “I Need You” (proper title was “I Need You (Like I Need A Hole In The Head)” is next – with Moon’s vocals and a surprising bit of subtle criticism at The Beatles in the lyrics. Entwistle’s second offering, “Whiskey Man” (pulled as the B-side to “Happy Jack” in the U.S.) is one of the album’s true high points and my personal favorite. Side one closes with the hilariously-deranged Keith Moon instrumental, “Cobwebs and Strange” (shades of a psycho ward’s brass band?). “Don’t Look Away” starts the second side – a piece of pure country pop, courtesy of Townshend’s pen and one of the most criminally-overlooked tracks of the Who catalog; Daltrey served up “See My Way”, a neat, Buddy Holly-style piece and Townshend’s classic “So Sad About Us” follows. Looked upon as a “Mod classic” (or pop classic, which is only right), its most famous covered version is by The Jam. Hooks, harmonies and melody make this a masterpiece. The album closes then with a piece of music innovation – the now (in)famous mini-opera, “A Quick One While He’s Away”. The short version of the story is there was still time to be filled in the studio – Kit Lambert told Townshend to just string together a bunch of short songs – and the band broke new ground by doing so. One of the greatest moments in Who history is also one of their most enduringly clever, subtly obscene (for the time), obviously risque and imminently unforgettable. The nine minute piece about loneliness, seduction, infidelity and reconciliation, broke new ground and was the blueprint for what Townshend later created as “the rock opera”.